You know Roma. You know Milano. But what about the Italian cities beyond the tourist guides? Join Italian Cultural Studies professor and Hot Docs favourite Dr. Franco Gallippi for a colourful journey across the great regional cities of his native land. Experience the rich history, stunning art and architecture, and mouthwatering food of Italy’s most beautiful regions, while discovering cities and towns that are filled with hidden gems. As Franco leads us on a quest to discover the many facets of Italian culture through its most celebrated citizens, landmarks, and historical centres, we’ll experience La Bella Italia as we’ve never seen it before. This course is led by Dr. Franco Gallippi, who completed his PhD in Italian Studies at the University of Toronto in 2007. He was Assistant Professor of Italian at McMaster University in Hamilton, where he taught Italian language, literature, and cinema, and is presently teaching at the Italian Cultural Institute in Toronto. He publishes his work on Italian literature and cinema in academic journals in Italy, Canada, and the United States. The importance of this city goes back to the movement that brought about the unification of Italy. It is the city of FIAT, and a beacon for countless Southern Italians seeking work and a better life. We’ll also visit two nearby cities, Alba and Asti, famous for their wines, but also for Italians who have defined Italian identity across the globe. Bologna is famous for its pasta and tortellini, and for having the oldest university in the world. After experiencing “Bologna la grassa” (Bologna the fat), and “Bologna la dotta” (Bologna the learned), we’ll pop over to Ravenna and Rimini - the homes, respectively, of extraordinary mosaics and the great director Federico Fellini. 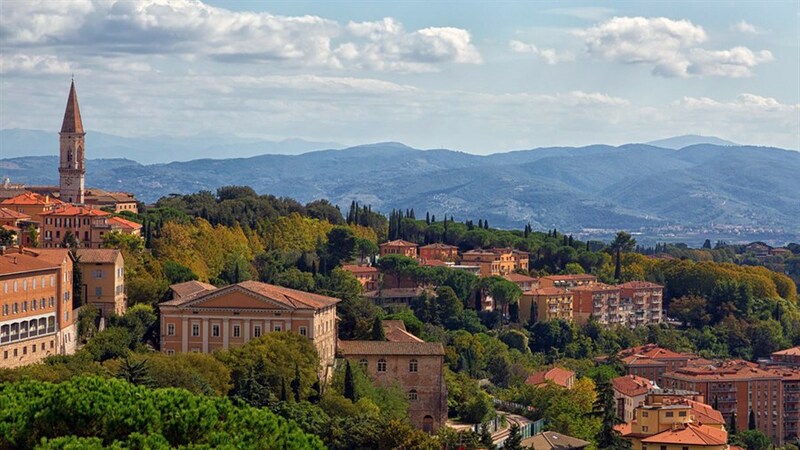 Perugia makes one think of world-class chocolate and Francis of Assisi, the patron saint of Italy, who lived most of his life nearby. After whetting our appetites with a discussion of the famous “baci perugina,” we’ll use the biography of Francis to explore the character of the people of Perugia and the region of Umbria, renowned across Italy for their hard work and stamina. L’Aquila is a lively university town lined with Baroque and Renaissance buildings and flanked by the highest peak of the Apennine mountains, “il Gran Sasso d’Italia” (The Big Rock of Italy). From this scenic vantage point, we’ll survey the many charmings towns in Abruzzo, one of Italy’s most picturesque regions: Sulmona, the birthplace of the great Latin poet Ovid; Civitaretenga, home of the best saffron in Italy; and Tocca da Casauria, famous for its Centerba liqueur. The home of the “Bronzi di Riace”, two Greek bronze statues that were found in the 1970s by an adventurous scuba diver, Reggio di Calabria has a rich history dating back to antiquity, when its high concentration of Greek settlers lent its surrounding region the name of “Magna Grecia”, or Great Greece. As Franco returns to his family’s native region, he will show us all that is still great about this sun-kissed, citrus-scented city.